Look behind you! A three-headed Sith Lord! 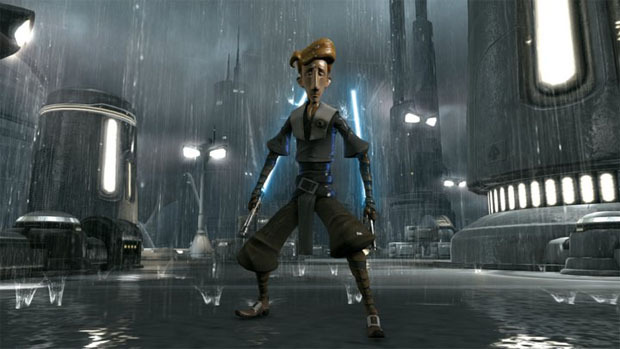 In one of the strangest bits of news I've heard all week, LucasArts has revealed that Monkey Island star Guybrush Threepwood will be appearing in Star Wars: The Force Unleashed II. The mightiest pirate in the Caribbean will be an alternate costume for Starkiller. If ever there were a way to convince me to pay attention to Star Wars, this would be it. The news was unveiled on the game's Facebook page, where a pair of images have been uploaded. Fan response there has been, shall we say, mixed judging by the comments on the image posts. Some of the comments seem positively incensed at the idea that something light and humorous might find their way into their sacrosanct Star Wars universe. That just says to me that some people take their entertainment way too seriously.